As well as the Climate Justice march there were other protests in London on 1st December, and I managed to photograph a couple of them, the first vaguely on my way to the Climate protest. 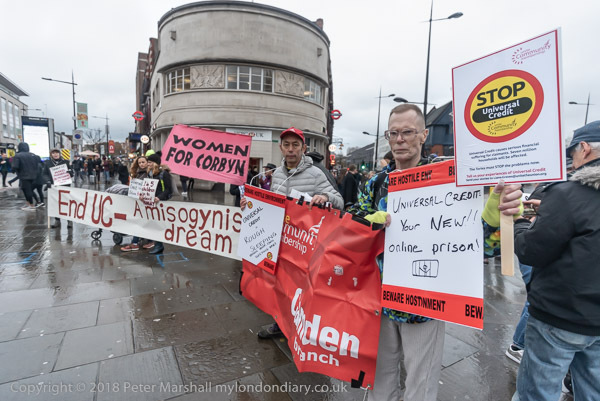 I took the tube a little further north to Camden Town, one of several London locations in a country-wide day of actions against Universal Credit. 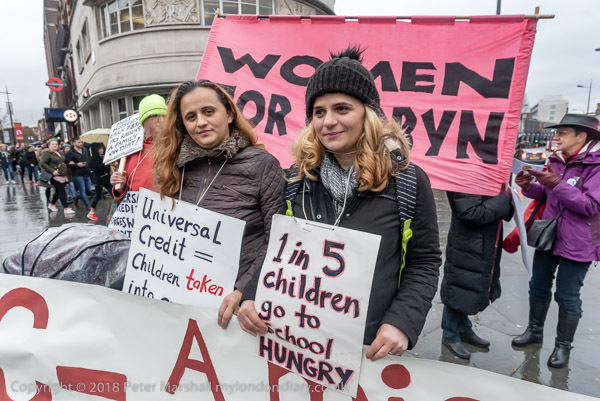 It appears to be universally recognised – except among a few die-hards in the DWP and the ministers concerned – that Universal Credit has been very much a Universal Disaster. Part of the reason for this has certainly been that it was for years led by that universal disaster of a politician Iain Duncan Smith, an outstanding example of Tory incompetence, reaching levels only surpassed by his confidence in his own abilities. While the aim of UC to simplify the benefits system was certainly laudable, it carried with it the aim to cut benefit payments, and is being implemented with a complete failure to understand the way that people in poverty actually live. There would have been few problems had this scheme designed by middle class people been for middle class people with their bank accounts, savings, friends and familiesto support them and tide them over the introduction, but applied to those living in poverty its results have been brutal; evictions, homelessness, destitution and even death by starvation. Although the main problems have been over the transition from previous benefits and for new claimants, with some being left for several months without any payments – and even when the system has worked as intended for around five weeks, various large categories of claimants have found themselves getting significant less after the transition. There is of course one area of success; food banks. Although the government has proved itself callous and hard-heated, people across the country have responded with warmth and generosity, making donations and working as volunteers. But it should never have been necessary, and the sight of Conservative MPs in a concerted Tory party campaign around the time of this protest posing for photo-opportunities at their local foodbanks was sickening and angered many of us. 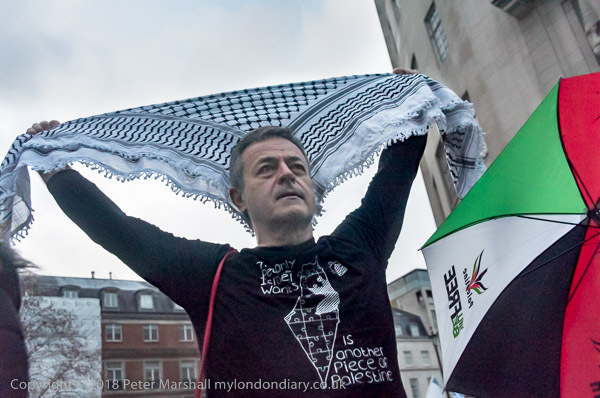 After the rally at the end of the Climate Justice march, I made my way more or less back to where it had started, to the BBC, where a protest was taking place calling on the BBC to boycott Eurovision 2019 because it is being held in Israel. It’s hard to think of a less compelling regular TV event than Eurovision, which must mainly appeal to tone-deaf masochists. But clearly it is something that the Israeli government is using in an attempt to heighten its reputation as they increasingly turn Israel into an apartheid state – most recently with the passing of the Jewish nation state law – and the continuation of its aggresive polices towards Palestinians, particularly in Gaza. 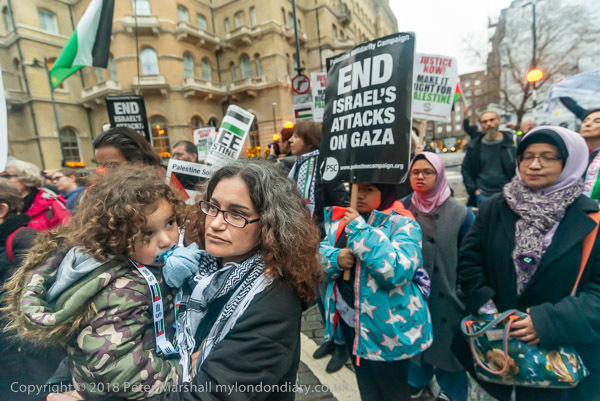 There should be a peaceful solution in the area that fully recognises the Palestinian rights in the area as well as those of Israel – as indeed Balfour stated back in 1917. I supported the boycott of the apartheid South Africa regime for many years, applying pressure on South Africa through economic and cultural boycott – at a time when many, including almost all the Conservative Party was opposed to it – and labelled people like Nelson Mandela as terrorists. Back then I often thought nothing would ever change, or at least not in my lifetime, but it came, and things changed more rapidly than we ever imagined. It gives me hope that the Boycott, Divestment and Sanctions (BDS) campaign will eventually lead to a similar reconciliation and change in the Middle East. 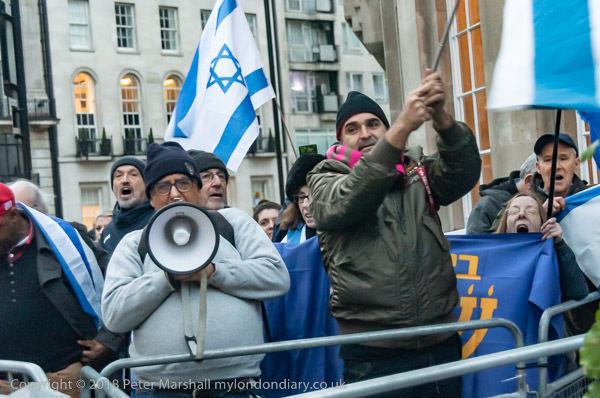 Some idea of the hate that will have to be overcome was provided by a small group of vociferous zionists who had come to try and shout down the protest. Hate is never an attractive sight. This entry was posted on Wednesday, February 6th, 2019 at 09:42 am and is filed under My Own Work, Political Issues. You can follow any responses to this entry through the RSS 2.0 feed. You can leave a response, or trackback from your own site.